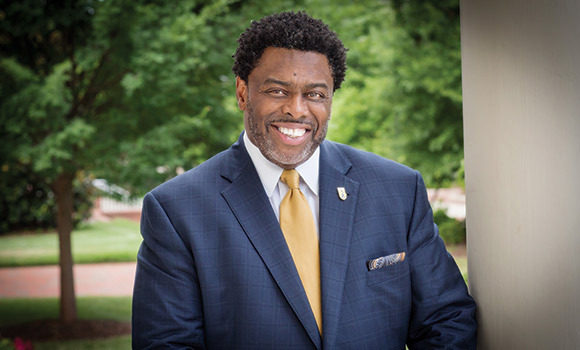 UNC Greensboro Chancellor Franklin D. Gilliam, Jr. was recently a guest on the “To a Degree” podcast, the postsecondary success podcast of the Bill & Melinda Gates Foundation. Gilliam appeared on “Episode 24: Reimagining the First Year and Beyond,” and talked with host Casey Green about student success initiatives in higher education and the role of university presidential leadership. Gilliam discussed the importance of building a student success infrastructure and directing resources from the top down. Specifically, he highlighted several UNCG efforts aimed at improving student success, such as participating in the Gates Foundation Frontier Set and a new $1.2 million grant for student mentoring and classroom modernization. With regard to his role, Gilliam highlighted three ways he believes presidents and chancellors can make a difference: hire the best people, promote your institution, and be present with students. To learn more and to listen to the full episode, visit the podcast website. The podcast is also available on SoundCloud and the Apple podcast app.